Fola is definitely an amazing photographer, he is very personable and helpful. No doubt, he was one of the best vendors that we had for our wedding. He is responsive (trust me, this goes a longggg way), he is on time, very professional and does good work. There's not much else you can ask from a vendor. Some specifics from our wedding, he highly encouraged us to take pre-wedding shots with him and we are grateful we did so. It helped us get to know him and see how he works with us. After our wedding (on Saturday), he sent us sneak peeks on the Monday #Amazing. He kept us up to date with his progress through the process. All this to say, we highly recommend Fola! Fola actually shot my cousin's wedding a couple years ago, and since then, I knew he would be my wedding photographer! For our engagement shoot, he went above and beyond to secure the perfect location for us to bring our vision to life. That said a lot about his character and the type of professional he is. Everything about his work screams quality. His responsiveness is top notch. I don't think I ever waiting more than 24 hours before receiving a response from him. He usually responded to emails within a few hours, which is something any bride to be would appreciate. He was very professional at all times and he was simply a joy to work with. When we got a little off schedule on our wedding day, he was very flexible and patient and made sure we were still able to get beautiful shots. When we received our wedding photos, we were blown away by the different angles he was able to get. Our pictures truly tell the story of our wedding day. If you are looking for a gifted wedding photographer to capture your big day, look no further! You will not be disappointed! Thank you once again Fola!! Fotos by Fola (Steve) is a miracle. He is kind, patient, creative, diligent, and brilliant. Our wedding and engagement photos were hailed by everyone as fantastic and I was blown away looking through the images by how he managed to capture moments perfectly. From the time we sat down months in advance of my wedding, he wanted to understand our vision for the day. He spoke to us at length over the course of wedding preparation about shot selection, locations, and timing. He understood the venues better than I did. He met with the wedding planner to make sure he understood what was important to us from a logistical perspective. He was, without a doubt, the best photographer I have ever worked with (and I have known a few). His use of light and color is inspired. He is the best vendor decision we made and I am grateful he was a part of our day. Thank you to Weddingwire for helping us to find this tremendously talented professional!! I would recommend Fotos by Fola to any bride and groom for their BIG DAY!! Fola is amazing! Even before I got engaged I always knew I would use Fola as my photographer when it came time to get married! I followed his work for years and was never disappointed. He is a professional and talented photographer. But most importantly, he has the warmest spirit and made our wedding day a success! Thank you again Fola. We look forward to working with you again! He did my engagement shoot, traditional wedding and white wedding. He was so accommodating especially since he was dealing with a non-tradition american wedding. Cant wait till he does my maternity shoot when that time comes..
Fotos by Fola is beyond extraordinary. He was was involved with the entire wedding process, from the surprise proposal, the engagement sessions, traditional marriage, the church ceremony, and reception. He has a way of making you so comfortable that you forget he is there. That is the beauty of his pictures: They are so natural! He also had great suggestions! We told him about our love for the Falcons and what did he do? He helped us schedule an engagement shoot at the Atlanta dome! Our wedding and memories would have dulled in comparison with out his involvement. But the thing that I appreciated the most was his advise throughout the whole process. During a "bridezilla" melt down before the reception, he reminded me of what was important (or i should say who was important lol), which was my husband and our marriage. He truly has a gift that is one of a kind! Fotos by Fola, Thank you for making my wedding day and the pics more beautiful and momentous than i could ever imagine! I can not say enough about Fola!! I was able to secure him two weeks before our wedding! What a blessing! He has such a laid back demeanor that made it very comfortable to communicate and work with him. We had a small, intimate garden ceremony followed by Sunday brunch. 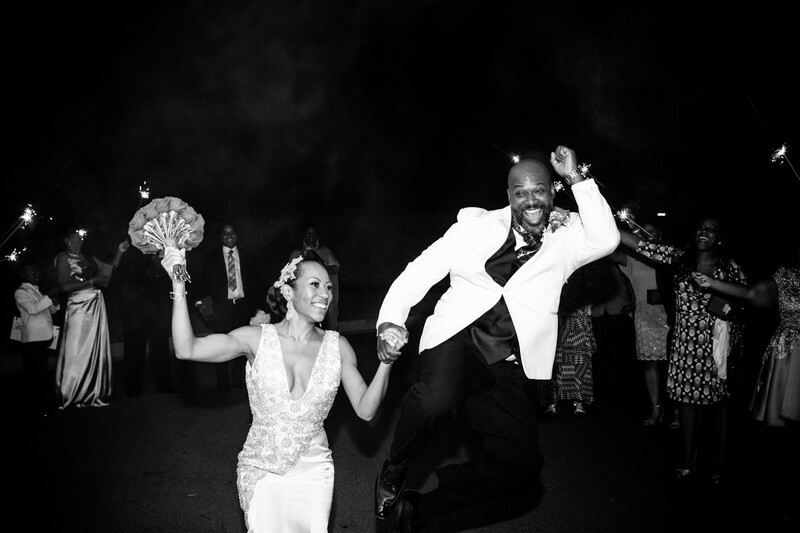 Fola' shots captured our day in such an incredible way! It is so wonderful to be able to relive our day over and over again from his brilliant perspective! Fola was professional, arrived early, always accessible and our photographs were completed in the allotted time. Most importantly, our wedding photographs are ABSOLUTELY AMAZING!!! Hands down, there is no other photographer that I would recommend! I am secretly eager to coordinate another event, so Fola can capture it too! Thank you so very much Fola! What more can I say about Steve? He was such a pleasure to work with. Steve took our engagements pics after a friend (make-up artist Crystal D) recommended him. From the moment I saw his pictures I know that I need not look any further. Our engagement pictures were stunning, we included our daughter and he made us feel so relaxed. Our wedding date was over a year and a half away and whenever I had a question Steve was always available until the very day. On our wedding day, Steve came to my hotel and sent his assistant to my husbands hotel. They both caught great moments and my husband and I were able to sit back and talk about. We did first looks, the hotel would allow us to use their rooftop so we had to do it in front of my hotel and Steve made it look soooooo beautiful. I didn't even care that we didn't use the rooftop. The wedding pictures were crisp and sharp. His eye for detail is amazing. We received our wedding disc in the time he promised. Book him! you wont regret it! Your wedding day is one of the most important day in your life. Everything has to be according to your preferences and specification. It was important to me that all the vendors that I use on the day of my wedding were people who are DOWN TO EARTH and are going to have my back on the day of my wedding because we all know we can plan and we can organize. I wanted a photographer that was truly going to listen to my ideas, but at the same time use their expertise to guide the photo shoots and pics. What I appreciated the most was the fact that he truly wanted to get to know my husband and I as a couple before the wedding day. He flew to Houston for our E-session just for us to get comfortable with a camera following us around. He was extremely flexible on the day of the wedding, and he was respectful of other vendors. I love love LOVE my final pictures! They are way better than I anticipated. I recommend Steve to anyone who wants quality service. If you are considering working with Fola, don't wait a second longer. I absolutely fell in love with Fola's photography when I saw his work featured on one of my favorite websites. (His work even inspired my wedding venue and I got married in the same location!) While Fola’s photography speaks for itself, actually working with him was such a pleasure. Fola’s willingness to accommodate our unique wedding made me absolutely comfortable entrusting him to capture our day. He was extremely reasonable, always responsive to my questions and requests, and amenable to the changes along the way. Our morning schedule was running a bit late and we were unable to get the pictures we had planned before the ceremony. That was not a problem for Fola. He used the time to get some other extremely creative shots, and still managed to get the photos I'd requested, plus so many more I was surprised to see when we got our photos back. My wedding was beautiful and I will always be able to cherish the memories of that day because of the beautiful photos he made for us. We can’t wait to work with him to capture our future family milestones. Fola is extremely talented and very easy to work with. We were really impressed with how accommodating and flexible he was. During the months leading up to the wedding, Fola did a great job communicating with us by providing timely responses to all of our emails. He was also prompt, professional, and thorough. Fola did an amazing job capturing our special day with a photojournalistic eye. His professionalism continued even after our wedding day, he was nice enough to provide a small sampling of the edited photos just days after our wedding. He also kept us informed of the completion timeline throughout the editing process. We have received so many compliments about our wedding photographs. We would definitely recommend Fotos by Fola to family and friends. After researching numerous wedding photographers and feeling dismayed about price and quality, I happened upon Fotos by Fola. I instantly knew that Fola was the one. The webpage for the photographer was easy to navigate. It was simple and shows you exactly what you came there for (proof of the quality of service). The photos were of the best quality I had seen. I sent an inquiry and got a response from Fola within hours. In fact, anytime I had a question for Fola, the response, whether via email or phone, was always really fast. We wanted to take our pictures within a two week time frame and Fola made it possible. When we met Fola at our session, he was such a professional and a joy to work with. My fiance and I were in love and Fola was in love with us being in love. That love came across in his product. The sweet moments he captured through the lens were genuine and incredible. Unlike the photos I had seen on other websites, nothing about our photo session with Fola was cookie cutter. Fola is an amazing photographer and really captures the moments that you want to remember for a lifetime. Even moments you didn't realize you had, Fola captures them. I'm teary eyed now, thinking about those moments that we are able to show with our family, thanks to Fotos by Fola. With Fotos by Fola we have truly found a life long photographer. From the beginning my husband and i agreed that photography for our wedding had to be the best, no matter the cost. After agreeing on that i started my search. I started following Munaluchi and Weddings on Point and some other sites. Our bridal party was BIG (22 people in total) so we really wanted someone who had experience with larger bridal party and that is when i found Fola. He had a big bridal party picture on some stairs that i fell in love with and i called him immediately. After talking with him and he understanding and loving my vision (which was a huge plus for any vendors i choose for that day) we agreed to book him. Trust me that was the best decision we made. We went down to Atlanta to take our engagement pictures (which are amazing btw) all with last last minute planning and that confirmed even more that we had the perfect fit for our most special day. Fola is AMAZING, the service is professional, caring, inspiring and Breathtakingly Beautiful. Fola puts his heart and soul in each picture he captures, plus he loves a colorful bunch. He really loves what he does and it shows in his work. He is extremely passionate about his work and he is diligent with his clients, which is a plus on the wedding day. So brides, if you are looking for a photographer that will share and capture your vision, look no further, His work speaks for itself. We absolutely loved the pictures. Thanks so much Fola. You captured our style in every photo. Your photos exceeded our expectations. Thanks a ton! What can I say…Fola is an AMAZING photographer. Never intrusive…and always capturing the most sincere of emotions on film. Harry and I and all our friends and family were stunned by the artistry in these pictures and the capturing of light, and perspective. Friends/family who have gotten married have told us that Fola’s pics are better than the photographers they used. He captured beautifully not only the proposal and the city we fell in love in…but the love/connection we share. Fola, Harry and I cannot begin to thank you enough for the memories you have helped us preserve for all time. The pictures turned out absolutely amazing, again. :) We can't thank you enough! You really have become our favorite photographer and we can't brag about you enough. Thanks again! We both thank you so much for capturing our special day in such a special way. You can feel the love when viewing them and I knew you would make that happen. Thank you so so much. Can’t wait to have you take our 10th Anniversary pictures as well. Thanks! Yay! Fola, we cannot thank you enough for these fabulous pictures. We love each and every one of them and it's amazing how they look so much better each time we look at them. We're supposed to pick our top 40 for our website and I'm telling you, it's tough! LOL. You made us feel so comfy and it was easy to be ourselves. I really wanted our pictures to show how much we love each other and how much fun we have with each other and I think that came through clear as day. May God continually bless the works of your hands!!!!! I LOVE our photos Fola! I honestly don't know how you narrowed the photos down as you did such an awesome job on the entire shoot. I can't pick a fave as I love them all. So proud of you and thank you very much!! Once again, I cannot stress this enough you are very talented at what you do and the pics are very nice. Thanks again Fola!! I'm in love with all these pics Fola!!!! You did an awesome job as they all look fabulous. I can definitely feel the sister love in the air mostly because you did a great job capturing the beautiful moments. Very impressive!!! Yaaaaaaaaaay Fola! Thank you so so much. Fola is really wonderful to work with. He is very patient and generous with his time. We appreciate you for giving us a lot of good shots..it's really hard to pick a favorite one but well... Nosaa and I are very glad you were available for both the engagement and wedding day sessions. Thanks a bunch! The pictures are awesome!! Thank u so much for making us look so good.your professionalism doesn’t go unnoticed! Thanks again for making our day special!!! This was a lovely day for photo’s and it shows. You will forever be recommended. You have a good, I mean a GREAT eye!!! Thank you so much for all your hard work! Chris and I love how the pictures turned out - our families love them too! We are so happy with the pictures!! Fola did a great job, and I would highly recommend him to anybody!!! Thanks again!